I am the world’s biggest Miss Marple fan. I love all of Agatha Christie’s books-but feel a special connection to her Jane Marple stories. Since I like her so much, I thought it would be fun to explore the idea of Living Miss Marple! I have lived through many an Autumn season, and its cooler days and colorful trees are something most inhabitants of my area look forward to. While I have observed the earliest of trees changing hue, the temperatures are still hot. Today was 90 degrees! How can one enjoy a bonfire in the evenings, or pull out flannel shirts if one is still sweltering after 6 o’clock (when a hot dinner is the last thing on one’s mind)? Tonight may well be eggs and toast (with homemade strawberry jam). Maybe an iced tea would be refreshing. I did get a little weeding done early and resisted trimming or deadheading the roses. 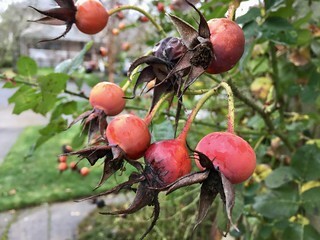 I did read somewhere that they must be left from September onward, to form rose hips. I wrote an earlier article last year on rose hip tea. 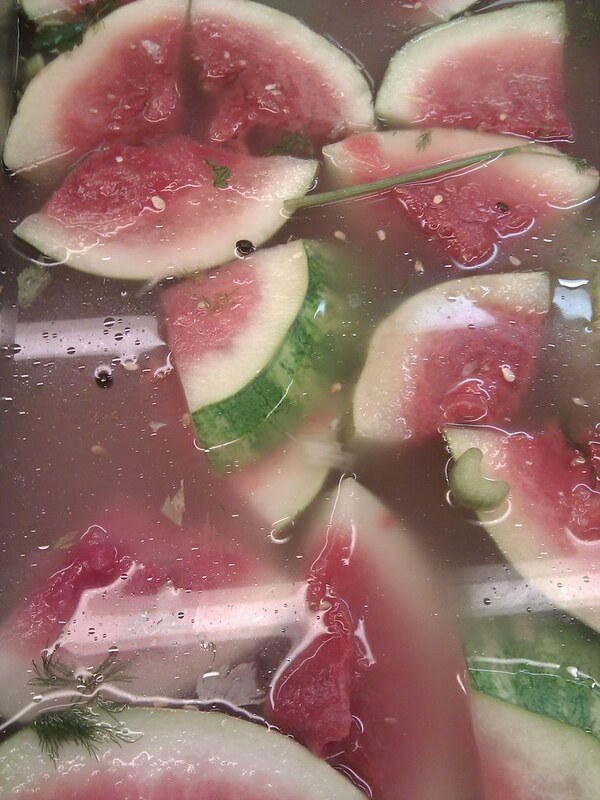 Today I made watermelon rind pickles for the first time. My husband has fond memories of his grandmother making these sweet, slightly spicy (in a good way) tidbits. Until today, I had never tasted such a thing- I have eaten cucumber pickles and green tomato pickles- but never watermelon rind pickles. I love how one can use up all of the watermelon- the pink center and the rind, and the outer green part can be composted. Don’t forget about the fun of spitting the seeds! Just think of what a treat this taste of summertime will be this winter when whining about the cold and dreaming about the warm summer to come next year! 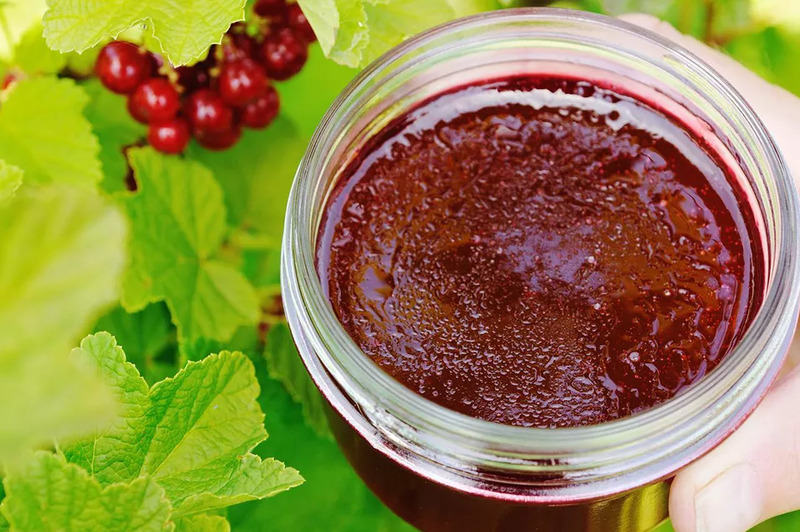 Red currant jam tastes sweet/tart similar to cranberry or rhubarb jam. I love buying small jars of jam and tins of specialty tea when I travel. Savoring a holiday long after it is over is such a treat. I do so love hydrangeas- especially the blue flowered ones. I have recently returned from a visit to the State of Washington, USA where I encountered the best specimens I have ever beheld! The blossoms on these magnificent specimens were similar in size to a dinner plate and wonderfully blue. If the soil in the garden is an acid Ph, the pink blooms will be changed to blue. Adding a product called Miracid to lime-rich soil can help achieve this coloration. I returned with a renewed determination to get my hydrangea blooming (I believe it is poorly placed on an unprotected north exposure and the wood does not survive each winter). Hydrangeas bloom on second year wood- hence, mine doesn’t bloom, or rarely has a poor show. 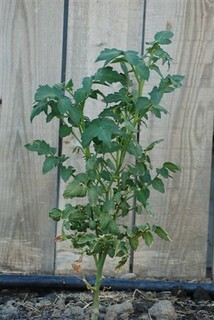 I have to research if moving my plant is an option, and if so, when. Where I am from, in Ohio, tomato and sweet corn season is upon us. My family and relatives had large gardens when I was young, and some still do. I have good memories of growing cucumbers, tomatoes, sweet corn, and runner beans. I was surprised by volunteer tomato plants growing in my compost pile earlier this summer. Four good looking plants, but in a little more shade than tomatoes tend to like. I am carefully watching and watering them. I staked them today with some good size branches that came down recently in my rear garden. Until they flower I will not know if they are viable, so in the meantime, I will enjoy a large tomato that my father gave to me with my dinner. Hubby will grill pork chops rubbed with his special mixture of spices that we call BUCKEYE BILL’S BBQ RIB RUB!! Many people nowadays do not remember life before matches (including myself). How did one transfer a flame from a fireplace to a candle? you might ask. The answer is that most people kept a supply of twisted long paper tapers or thin long strips of wood above the fireplace in a holder of some type. A popular place to store these papers, which were called “spills” was in a vase on the mantle. Today, while browsing the Goodwill store, I found a pewter spill vase (or bud vase, perhaps). I will clean it after looking up instructions on pewter care and put it on my fireplace mantle (when it is finished- work commences in the next few months)! In Charles Dickens’ A Christmas Carol, the ghost of Christmas Present scolded Scrooge for complaining about “the surplus population,” and compares his attitude to insects complaining that there was too much life to share with their hungry brethren. Overnight, it seems, that life goes from blossom to boom in my garden. I complained when I felt that Spring would not arise from the cold- bitten tundra and now I complain that there is “too much life in the garden”!! 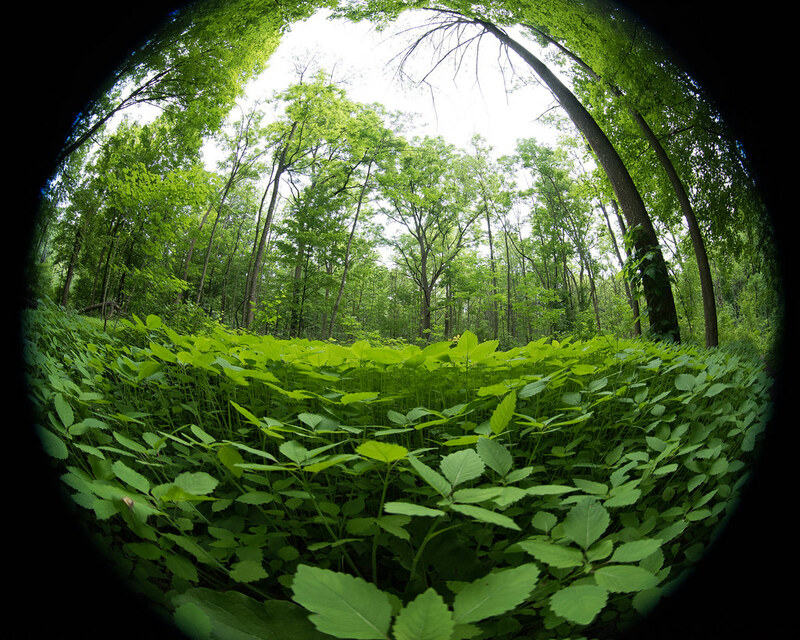 I am referring to the grasses that grow, weeds that vie with the plantings, and trees whose branches, leaves, seeds and fruits are sometimes inconvenient. When I start to complain about the abundance of greeny life in my patch of the world, I need to remember those cold days. My weeds and grass clippings, branches and dead heads will be gathered and returned to the Earth and more life will be in the making!! 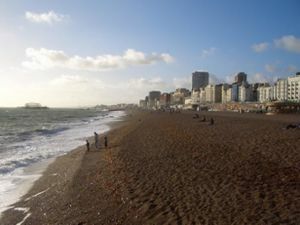 Many English vacations are spent at the seaside. I picture Pride and Prejudice’s scene whereupon the young ladies wish to go to Brighton. My family and I recently spent a week at the beach- not Brighton, but Bethany Beach in Delaware, USA. It is our favorite vacationing spot and we enjoyed it immensely again this year. There is something special about sea air. I love it- I even love the smell of the seafood shops (my son gags). I spent many an evening sitting at the shoreline with my father who we also included in our trip. The walks on the beach, wading in cold sea water, collecting shells (and a mysterious crustacean), watching the ships both on the horizon and the closer ones- it was so different from my green Ohio’s hot and sticky season. Miss Marple is known for her knitting and frequently she is knitting tiny outfits for godchildren and nieces and nephew’s offspring. I am interested in learning- it is a very portable hobby. At the shops, I am frequently drawn to the pretty and soft yarns on display, but I only know how to braid and make pompoms! So my poor nieces and cousins will perhaps receive a little sketch, a flower, or a jar of my latest jam. Perhaps I will be able to make a small blanket in time for the next round of younglings! I love celebrating special days. 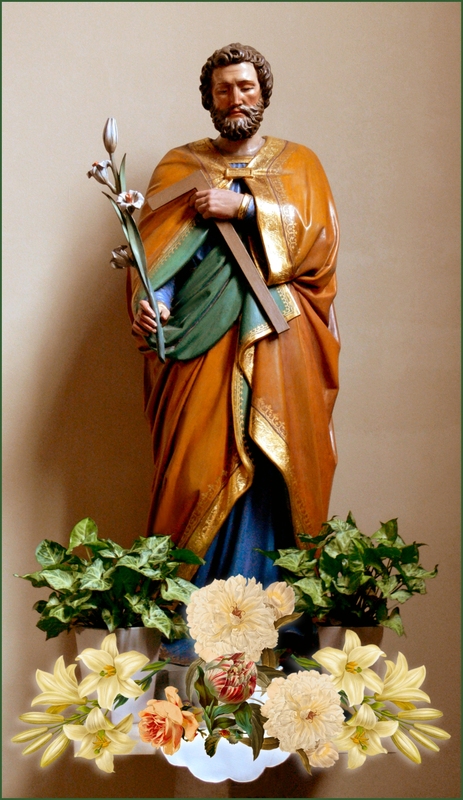 A recent festival day I had the pleasure of celebrating along with my daughter and husband was St. Joseph’s Day, March 19. A local friend and his family host what is called St. Joseph’s table and we were graciously invited for the past two years. Since it is held during Lent, no meat is served, but there is plenty of fish! Typical festival foods include fish, meatless entrees topped with breadcrumbs (remembering that St. Joseph was a carpenter), fava beans, artichokes, lemons, breads topped with sesame seeds, and filled pastries. Wearing red is traditional, and an alter to honour St. Joseph is displayed. As we left the home, we received St. Joseph holy cards, and a dried fava bean that has been blessed. What a fun and special day- and right after St. Patrick’s day!